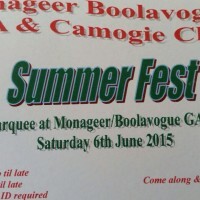 Monageer Boolavogue GAA & Camogie Clubs are hosting a Summer Fest. 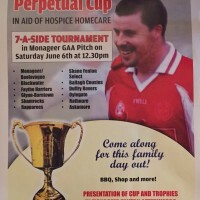 The venue is The Marquee at Monageer Boolavogue GAA grounds on SATURDAY 6th June 2015.
on generic celebrex Saturday nexium withdrawal the 6th JUNE in Enniscorthy. The course online cialis generic will cialis24hour-pharmacy.com run from 10am until 4pm. Well done to the U12 camoige team who had a great day at the blitz in Cranford.Training will be every Tuesday and Thursday from now on.There first match is on Friday 15th May in Horeswood against Horeswood. Well done to Michaela Hawkins on representing Monagear/Boolavogue Camoige club in Farmleigh at the Feile Skills Day. The minor girls put up a great performance against the Raperees on Tuesday evening in Monageer. They were unlucky in the last few minutes of the game when the Rapparees scored two late goals. The end score was Raparees 3:12 to Monagear/Boolavogue 2:5. The goals came from Sarah Figgis and Michelle Kehoe, with the points coming from Emma O’Dowd and Michelle Kehoe. Supermarket. Next draw takes place on the 27th May.